I love your mountain shots—especially. I live in Virginia, and grew up at the foot of the Blue Ridge Mountains. 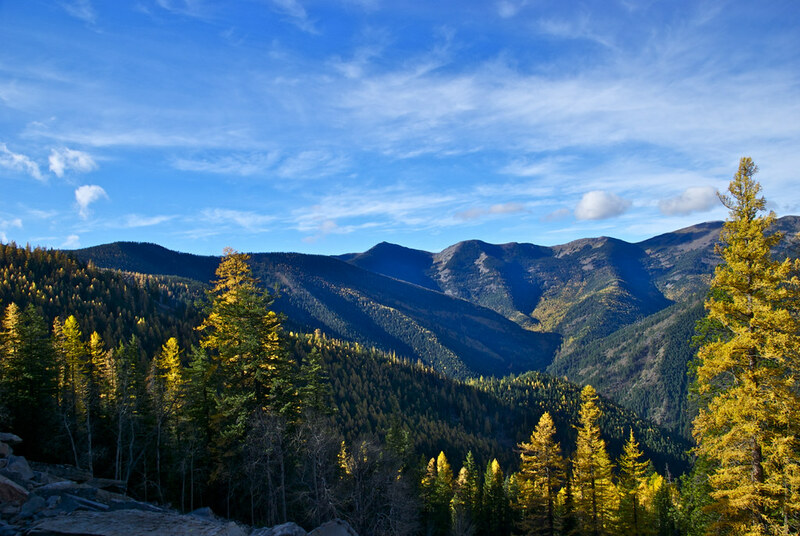 The beauty of the two ranges vary, but they both flaunt their majesty in their own unique ways. You should stop by and check out a post I did on the Shenandoah Valley, and do your own comparison. 🙂 Thanks for sharing your photos. They are breathtaking. I would love to come to Montana and ride sometimes. I imagine the Mountains are exceptionally spectacular from the back of a horse. I’ve heard and read so much about the Blue Ridge Mountains, but have never had the chance to see them for myself. I know I would love them if I did! In the early 1900’s a large number of fire lookouts were built on Montana mountain peaks, 639 to be exact, and most of the old pack trail that were constructed to enable pack strings to get up there to supply them still exist, making many miles of great horse and hiking trails. You would enjoy some of them! Thanks! I hope you do get out this way Boyd. I’m sure that you would add a lot of landscape photos to your collection! The larches! Now it looks like autumn there. 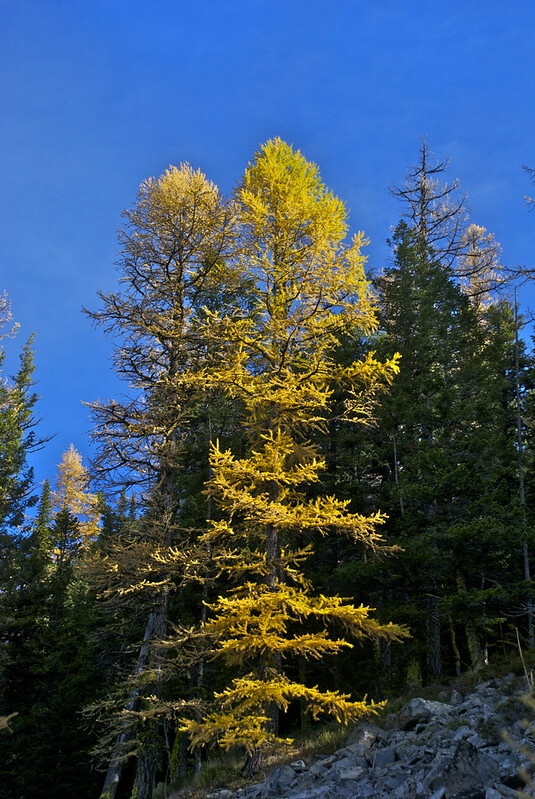 The larches are rapidly going through their cycle now. Those in these photos got a coating of snow last night and probably more tonight. Really lovely, especially against the blue sky. It’s still very mild here but we have had gales for the last week or so now, and most of the colours are gone. Autumn is over very suddenly! That blue sky was a bonus. It started out very cloudy and gloomy that day. Our trees are rapidly shedding their leaves now too and there is new snow on the mountains around the valley. We have some of these beautiful trees too, but they are alien speices in Norway. Interesting that they were transported there. I bet they do well in your climate. 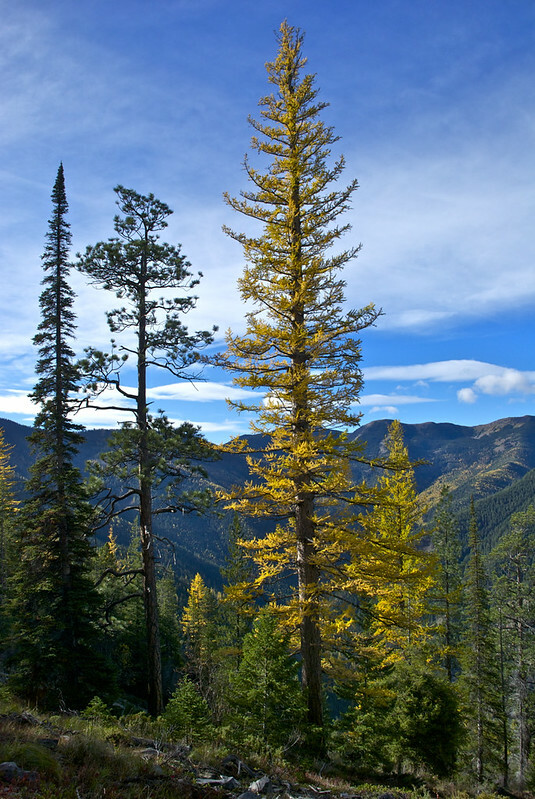 Larches are beautiful when they turn and that last shot is really breathtaking. I was looking at our larches last weekend and they hadn’t started yet. When it starts it happens fast so I’ll have to take another look soon. I hope you catch them at the peak. I’m afraid that I’ve missed much of their color this year. I love all of the trees, but it would be hard on me to miss the larch when it turns gold! The breeze today felt really cold as it came down from crossing the snow-covered ridges. Now there will be a week or two of my least favorite time of year, when the temperature hovers around freezing at night and there is fog/rain/snow in the air. Not a good time for bad drivers and first responders! Saw these on the way home last week. They sure set off the conifers that stay green. Great fall colours. Yes, they are highlights of the forest! I love driving the back roads on a new carpet of their needles too. Nature takes care of almost everything. Indeed, and yet so many think that it is because of us, or for us. Yes, in winter they look as though they were dead. I’ve seen times when firewood cutters (who are allowed to cut dead trees) have fallen one by mistake.